Poll finds 10% drop in support for dividing country, majority oppose evacuation of Jews; 56% of Palestinians think they'll be expelled. 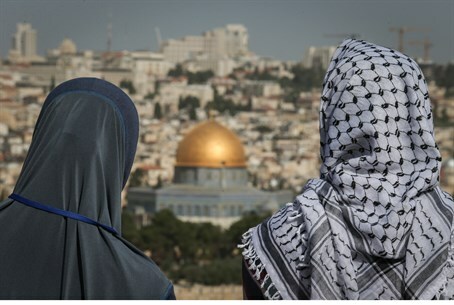 Only 51% of Israelis - down from 61% last year - support the "two-state solution" by which the Biblical heartland of Judea and Samaria would be turned into an Arab state, according to a new poll conducted in early June. The poll was conducted jointly by the Harry S. Truman Research Institute for the Advancement of Peace at Hebrew University in Jerusalem, together with the Palestinian Center for Policy and Survey Research (PSR) in Ramallah. As for evacuating Jewish towns, 38% of Israelis support dismantling most communities in Judea and Samaria as part of a peace deal, but a wide majority of 54% oppose such a move. In the last year support for the "two-state solution" dropped remarkably not only among Israelis but also among Palestinian Arabs in Judea, Samaria and Gaza. Among Palestinian Arabs, support was also at 51% for the "two-state solution" after having been at 54% last summer. The research showed that both sides continue to view the intentions of the other as an existential threat, with 56% of Palestinian Arabs saying Israel plans to annex Judea, Samaria and Gaza and expel the Arab residents, while 25% say Israel plans to annex Judea and Samaria and not give Arab residents there political rights to vote and determine the fate of the Jewish state. On the Israeli side, 43% think the Palestinian Arabs plan to conquer Israel and destroy much of the Jewish population, and 18% think their goal is only to conquer Israel. A full 802 Israelis were interviewed in Hebrew, Arabic or Russian. No less than 1,200 Palestinian Arabs were interviewed in Judea-Samaria, eastern Jerusalem and Gaza as part of the poll.